(Beyond Pesticides, January 25, 2019) The partial government shutdown–now in its second month–is disrupting federal oversight of food safety for various pathogens and pesticides. Labs are shuttered, many government agency employees are furloughed, and those still working are doing so without pay. The ongoing obstruction to government assessment of the food supply puts U.S. consumers at risk. Workers from the Association of Public Health Laboratories (APHL) have expressed concerns about the U.S. Department of Agriculture’s (USDA) AMS Pesticide Data Program. This program samples, tests, and reports about pesticide residues in U.S. agricultural commodities, with a focus on chemicals that could cause problems for infants and children. Peter Kyriacopoulos, senior director of public policy at APHL, stated that only one of the ten public health laboratories is planning on continuing testing samples during the shutdown without compensation. Additionally, APHA has reported issues regarding DNA analysis of food samples involved in foodborne outbreaks. DNA samples from sick patients are used to trace back the source of outbreaks and lead to assessment of food production facilities. 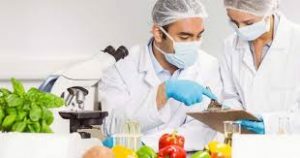 While outbreak investigations are headed by the currently fully-operational Centers for Disease Control and Prevention (CDC), interdepartmental research involving the USDA and Food and Drug Administration (FDA) is delayed due to furloughed employees and lack of funding for laboratories. A December news release from USDA outlined the list of inspection functions during the lapse of funding beginning January 1, 2019 to include: Meat, poultry, and processed egg inspection services, grain and other commodity inspections, as well as import/export inspections for pests. The complicated, intertwined effects of the government shutdown are deeply concerning. The long-term consequences to the lack of oversight to food safety are yet unknown, and there does not seem to be a quick end to the shutdown within sight. NBC News reported on January 23 that the Trump administration has asked for a list of programs that could be affected if the shutdown continues for additional weeks, signaling preparation for an ongoing stalemate until, perhaps, March. If you are concerned about what kinds of pesticides could be in your food, especially with lack of regulation, you can utilize Beyond Pesticides’ Eating with a Conscience database. The organization evaluates the impact of toxic chemicals allowed for use on individual fruits and vegetables grown domestically and internationally. This entry was posted on Friday, January 25th, 2019 at 12:00 am	and is filed under Centers for Disease Control and Prevention (CDC), Environmental Protection Agency (EPA), Food and Drug Administration (FDA), Uncategorized, US Department of Agriculture (USDA). You can follow any responses to this entry through the RSS 2.0 feed. You can skip to the end and leave a response. Pinging is currently not allowed.